Unless you are a knowledgeable chiropractor or have some kind of affiliation with physical therapy, you probably have no idea what a tilted pelvis is or how it can affect your daily life. In fact, some people go throughout their lives dealing with the discomfort caused by this condition when they could have it diagnosed and treated. The first sign that you should see if you have a pelvis that is tilted tends to be pain in the lower back. If you experience consistent pain in your lower back, you might want to see a chiropractor as soon as possible. If you have this condition, it can be helped! 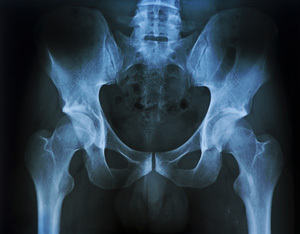 You might be wondering exactly how a person can have a pelvis that is tilted. There are some typical ways it can happen. Sometimes you can tilt your pelvis when straining a muscle in the lower torso. Another way to tilt your pelvis is by sitting for long periods of time without stretching. This can cause the dorsal hip muscles to tighten and tilt the pelvis. Dehydration can also cause the dorsal hip muscles to become inflamed and make the pelvis tilt. One of the first signs that can indicate a possible tilted pelvis is constant lower back pain. Almost everyone experiences lower back pain at some point, but this is a pain that is consistent and doesn’t go away. Another indication that a pelvis might be tilted is if a person believes that their back isn’t quite aligned or that one leg appears to be longer than the other one. These can indicate a number of things including a possible pelvis problem. The most accurate way to diagnose a tilted pelvis is to seek out an examination by a qualified physician like a chiropractor. One method used to help diagnose someone with a pelvis that is tilted is to evaluate the length of the legs while the patient is lying on his or her back. A difference in the length of the legs could indicate a problem with the pelvis being tilted. Another test to diagnose and confirm a pelvis tilt is to see if the legs are of equal length while the patient is both seated and lying motionless on their back. By taking measurements while the patient is in both positions, the doctor can see if there are any variations in length. Any differences could mean that there is a tilting of the pelvis. Additional examinations should include tactual exploration of the dorsal hip muscles. While the patient is still lying motionless on their back, the doctor will see if there is any soreness when gently pushing on those muscles. Soreness on the side of a shorter leg can indicate a pelvis tilt. Having a pelvis that is tilted isn’t something to fear. While it can be painful before a diagnosis, it is treatable! A chiropractor will perform a complete exam and, based on the findings, can suggest one or a combination of treatments to alleviate lower back discomfort. One such treatment might be to adjust the spine in order to return the pelvis back to its natural position. Another method is to perform electrical muscle stimulation using heat. This reduces spasms in the muscles caused by a tilted pelvis. Medication to help relax the muscles and relieve pain is also another option. Some chiropractors prefer to teach their patients how to stretch in order to elongate the dorsal hip muscles. If the pelvis tilt was caused by dehydration, clear directions on rehydration and proper daily hydration will also be provided. Once a chiropractor has diagnosed and prescribed a course of treatment for someone who has tilted their pelvis, their recovery must continue once they get home. A good chiropractor should provide instructions on how to avoid causing additional injury to the muscles, a routine of regular exercise that often includes walking, how to sleep to avoid further aggravation of the muscles and any dietary changes necessary. Back pain can impact any person’s daily life but it can be especially difficult when the pain is consistent. If you suspect you might have a tilted pelvis, seek out the help of a reliable chiropractor or other trusted physician. You don’t have to suffer and with the right diagnosis and guidelines, you could be feeling as good as new in no time!